This week, Samsung, which noted that it has the highest market share in the U.S. for cell phones overall according to “several analyst firms” (ahem), gave notice that it is now getting into the smartphone market for real with the launch of the Galaxy S. Samsung is indeed making a big splash with this device. Unlike similarly specced devices that are exclusive to one carrier, different flavors of the Galaxy S will launch on all four major U.S. carriers. This should work to Samsung’s favor when it comes to gaining smartphone market share, but may also reflect the phone’s arrival date, coming in after Sprint and Verizon are making big bets with their 4.3” Android devices in a bid to fend off the iPhone. But the branding of the deices will go beyond the model numbers used for the BlackBerry Curve on multiple carriers. Rather, they will each have distinct names and, in most cases, distinct industrial designs. On the verb camp are the Verizon Fascinate and AT&T Captivate while Sprint and T-Mobile have adopted adjective names with the Vibrant and Epic 4G. Yet they are all identified as Galaxy S smartphones. Having checked out the phones for a bit earlier this week, I have a few early thoughts. First, the screens are very bright and do well in direct sunlight, although they are not significantly brighter than that of the iPhone 4. That said, the extra resolution and screen size of the Galaxy S’s screen enables it to display more of a Web page without striking one as overwhelming the way the Droid X and HTC EVO 4G do. 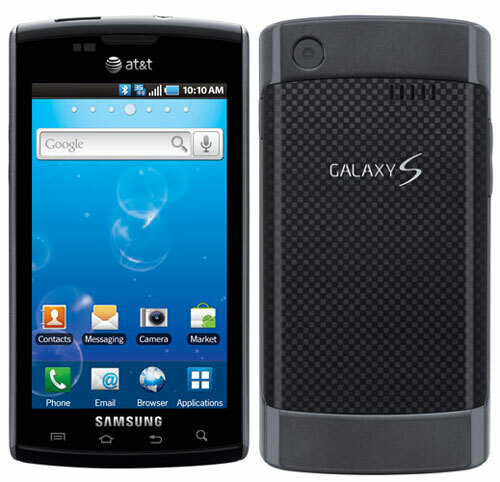 By far, the most differentiated Galaxy S is the Epic 4G, not only because of its radio (per its name), but also because of its WiMAX access capabilities, but also because it is the only Galaxy S with a slide-out keyboard. While we wait to see what the Droid 2 brings, the Epic 4G’s keyboard is much better than that of the original Droid’s, and may be the best Android device with a physical keyboard when it launches. Beyond that, the AT&T Captivate has the most differentiated industrial design, with a rounded top and bottom. The Fascinate and Vibrant are the most similar designs. Each has rounded corners and the Vibrant in particular resembles the design of he iPhone 3G/3GS with its silvery trim. The Vibrant will easily steal the show as the new top of the line in T-Mobile’s portfolio. The Fascinate will need to duke it out with the Droid Incredible and Droid X, but I suspect it will be very competitive with the former as the choice of the mainstream advanced user. Incidentally, the Fascinate’s branding offers another clue into the quirky rules regarding what gets the Droid brand at Verizon; the device is not the Droid Fascinate. My take now is that Droid is reserved for high-end, exclusive Android phones.